Every now and again I feel like doing something different with duck rather than taking home a tin of duck confit or one of our frozen meals of duck à l’orange. 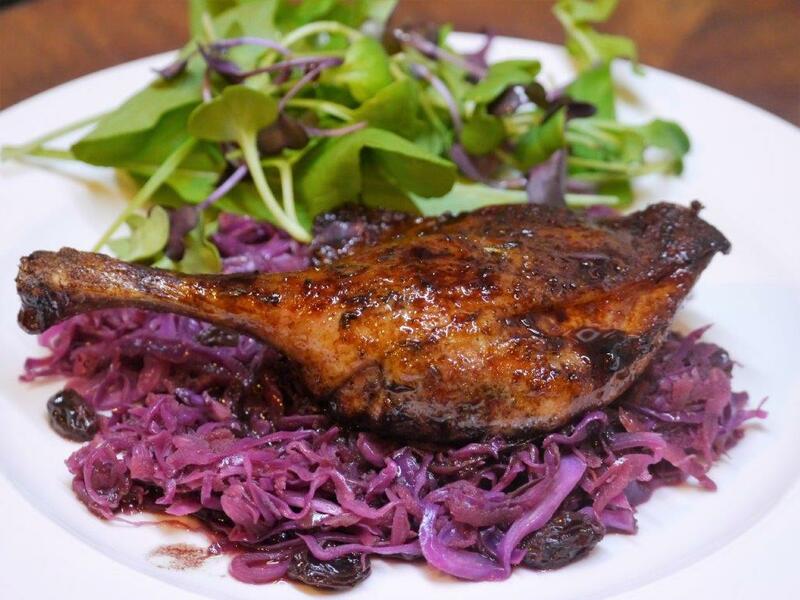 For this recipe I cooked the duck legs in a red wine and cassis sauce and served them on braised red cabbage which worked really well as a balance to the richness of the duck. I served this with a little rocket for a peppery contrast and a few duck fat roasted potatoes. Mix together the 5 spice powder and salt and rub all over the duck pieces. If possible, cover and leave for at least 2 hours. Heat the oven to 170°C. Heat a heavy oven proof frying pan and place the duck legs in it, skin side down. Tuck the fresh herbs around. Turn down the heat a bit so the legs don’t brown too quickly and leave the legs for about 10 minutes. They need to brown and release their fat. Turn them over and quickly brown the other side. Then pour off any excess fat. Add the chicken stock to the pan. It should come half way up the legs, ie not submerging them. Put in the oven and leave for 30 minutes. Then add the red wine and cassis and cook for a further 30 minutes or until the duck is done to your liking. If the legs are large, they’ll take longer. About 15-20 minutes before you want to serve the duck start the cabbage. In another frying pan put the two vinegars, water, cabbage, apple and raisins. Cover and cook on low/medium heat for a few minutes, stirring from time to time as the cabbage wilts and braises. Add a splash more water if you need to. Just before its ready, take the lid off and add a couple of large spoonsful of the red wine sauce from the duck. Let that evaporate a bit and add more if you want to. I did as I really liked the flavour combination. Once the duck is cooked, keep it warm for a minute while you reduce the red wine sauce on a high heat for a minute or two. Serve the duck legs on a bed of braised cabbage and spoon over the rest of the sauce.